I have an Overlord X270OC which I've been running for a while with settings in CRU that go up to 120hz. I'd left the monitor set at 64hz for a while because I hadn't been playing any games lately, but today I went to set it to 120hz and I found that the settings for 100 and 120 had simply disappeared. I tried re-adding them in CRU, tried updating my graphics driver and restarting the computer, etc, and nothing helped. 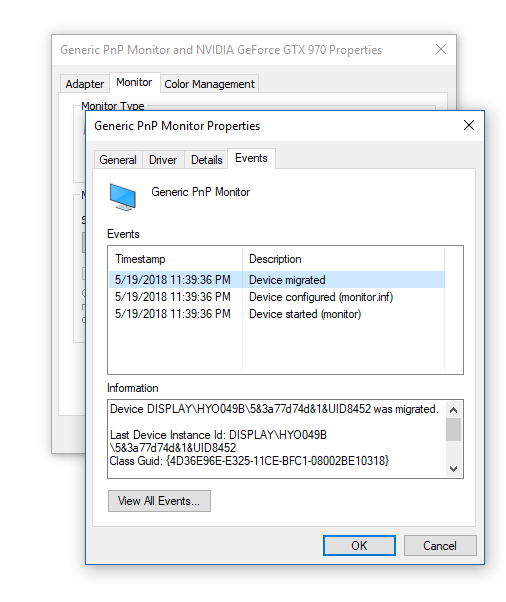 The only settings visible under Display Adapter Properties -> Monitor are 64hz and 80hz. Anyone have any idea how this happened, or how I could fix it? It seems somehow Windows has just forgotten that this monitor is capable of displaying higher refresh rates, despite the settings in CRU. Maybe it's something with that .inf file? Did you patch the driver? (05-30-2018 09:15 PM)ToastyX Wrote: Did you patch the driver? I haven't done anything to the driver. It appears that Windows 10 may have changed it in that update 9 days ago. I noticed also that when I right click the desktop and go to Display Settings -> Advanced Display Settings, the menu there is not the same as it was before the update. edit: Yeah, that did it, thanks. After updating my display drivers (the newest for the GTX 970), this problem has returned, but this time the pixel clock patcher isn't fixing the problem. I used version 1.4.3 and it says that all limits are found and patched, but for some reason none of my settings above 80 hertz will show up under monitor properties. edit: I was able to fix the issue by reverting to the previous video driver I was using and re-patching. The version of the Nvidia driver that wouldn't work after patching is 416.34. I wonder if Nvidia messed something up, or if they're changing their drivers in a way that the patcher won't work with.